Gold Morocco Aprons There are 11 products. 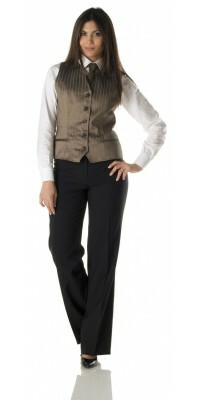 Professional Wear: Aprons for Bar and Cafeteria Waiters. 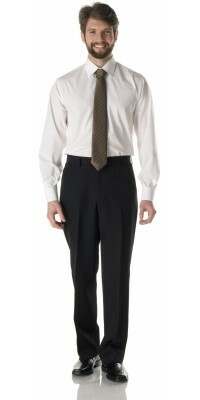 Perfect for a cafeteria, a pastry shop and for a refined waiter service, the Professional Wear series Gold Morocco completely merges in the modern settings as well as in the more classic ones; in fact, the fabric the garments are made of, a wrinkle free shiny-shimmering Gabardine 100% polyester, makes them very elegant and up-to-date. - the Saronno Apron and the Amelia Apron, both with the bib, are conceived for the counter service; the different cuts and sizes of the garments make the first model more suitable for the male staff and the second one for the female staff. - the Bari Apron and the Trani Apron, on the other hand, are models without bib, often more suitable for the table service (waiter and bar); there are two sizes: the first one, smaller and “easy”, arrives up to the knee and the second and more elegant one arrives nearly to the ankle. 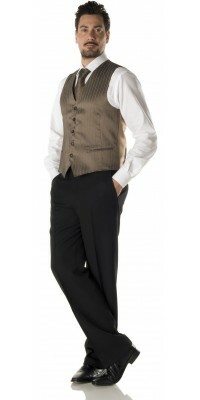 The Gold Morocco series also includes two vests with five buttons: the women's Zurigo Vest and the men's Varsavia Vest; in both models the back is made of a gold coloured fabric. This pretty series of professional wear is completed by ties in coordinated colors and the forage hat for the counter attendants. 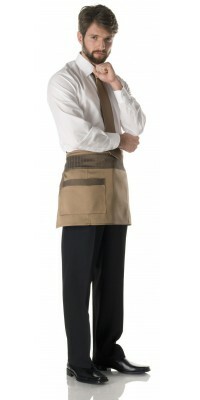 Unisex short apron with bib, model Ameliawith a side pocket applied Ancient gold colour, glossy-iridescent fabricMade of Shiny-Satin Gabardine, 100% Pol. Unisex short apron, model Baria big pocket applied on the sideMorocco striped, glossy-iridescent fabricsize cm 40 x 80Made of Shiny-Satin Gabardine, 100% Pol. 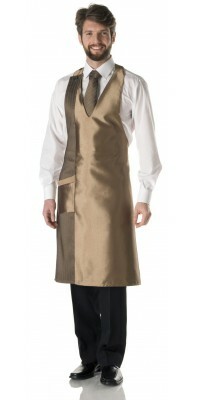 Unisex long apron with bib, model Saronnowith a pocket appliedAncient gold colour, glossy-iridescent fabric Made of Shiny-Satin Gabardine, 100% Pol. 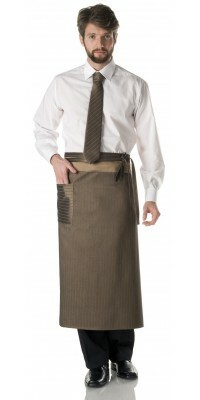 Unisex long apron, model Trania big pocket applied on the sideMorocco striped, glossy-iridescent fabricsize cm 85 x 95Made of Shiny-Satin Gabardine, 100% Pol. Unisex short apron, model Baria big pocket applied on the sideAncient gold colour, glossy-iridescent fabricsize cm 40 x 80Made of Shiny-Satin Gabardine, 100% Pol. Women's vest, model Zurigo Morocco striped, glossy-iridescent fabricback made of ancient gold glossy fabric, linedImmediately available for delivery: sizes from S to XL Made of Shiny-Satin Gabardine, 100% Pol. Unisex vest with 5 buttons, model Varsavia Morocco striped, glossy-iridescent fabric back made of ancient gold glossy fabric, linedImmediately available for delivery: sizes from S to XL Made of Shiny-Satin Gabardine, 100% Pol. Tie made of Gabardineclassic modelMorocco striped, glossy-iridescent fabricone sizeMade of Shiny-Satin Gabardine, 100% Pol.